Once the capture volume is calibrated and all markers are placed, you are now ready to capture Takes. In this page, we will cover key concepts and tips that are important for the recording pipeline. For real-time tracking applications, you can skip this page and read through the Data Streaming page. There are two different modes in Motive: Live mode and Edit mode. You can toggle between two modes from the Control Deck or by using the (~) hotkey. The Live mode is mainly used when recording new Takes or when streaming a live capture. In this mode, all of the cameras are continuously capturing 2D images and reconstructing the detected reflections into 3D data in real-time. 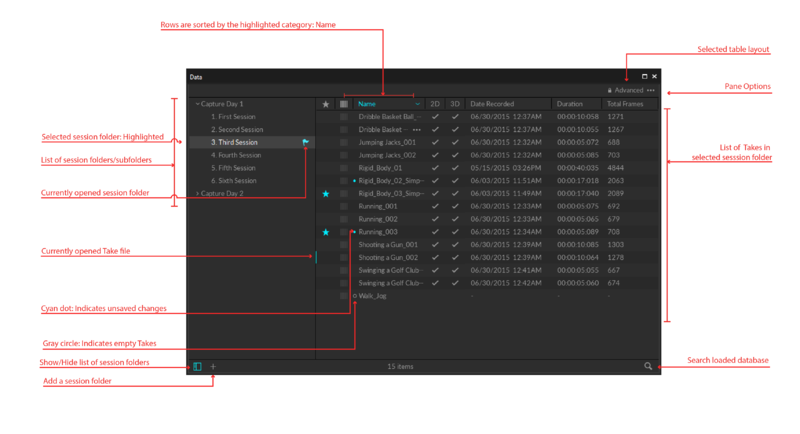 The Edit Mode is used for playback of captured Take files. In this mode, you can playback, or stream, recorded data. Also, captured Takes can be post-processed by fixing mislabeling errors or interpolating the occluded trajectories if needed. In Motive, capture recording is controlled from the Control Deck. In the Live mode, new Take name can be assigned in the name box or you can just simply start the recording and let Motive automatically generate new names on the fly. You can also create empty Takes in the Data Management pane for a better organization. To start the capture, select Live mode and click the recording button (red). In the control deck, record time and frames are displayed in (Hour:Minute:Second:Frames). Tip: For Skeleton tracking, always start and end the capture with a T-pose or A-pose, so that the skeleton assets can be redefined from the recorded data as well. In Motive, all of the recorded capture files are managed through the Data Management pane. Each capture will be saved in a Take (TAK) file, which can be played back in the Edit mode later. Related Take files can be grouped within session folders. Simply create a new folder in the desired directory and load the folder onto the Data Management pane. Currently selected session folder is indicated with the flag symbol ( ), and all newly recorded Takes will be saved in this folder. Always start by creating session folders for organizing related Takes. (e.g. name of the tracked subject). 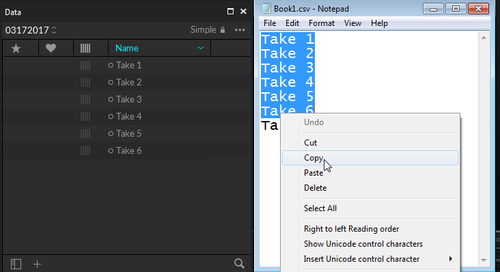 Plan ahead and create a list of captures in a text file or a spreadsheet, and you can create empty takes by copying and pasting the list into the Data Management pane (e.g. walk, jog, run, jump). Once pasted, empty Takes with the corresponding names will be imported. Select one of the empty takes and start recording. The capture will be saved with the corresponding name. If the capture was unsuccessful, simply record the same Take again and another one will be recorded with a incremented suffix added at the end of the given Take name (e.g. walk_001, walk_002, walk_003). The suffix format is defined in the Application Settings. When captured successfully, select another empty Take in the list and capture the next one. When a capture is first recorded, both 2D data and real-time reconstructed 3D data is saved onto the Take. For more details on each data type, refer to the Data Types page. 2D data: The recorded Take file includes just the 2D object images from each camera. 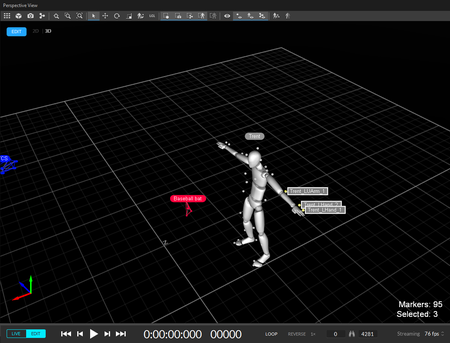 3D data: The recorded Take file also includes reconstructed 3D marker data in addition to 2D data. Throughout capture, you might recognize that there are different types of markers that appear in the 3D perspective view. In order to correctly interpret the tracking data, it is important to understand the differences between these markers. There are three different displayed marker types: markers, rigid body markers, and bone (or skeleton) markers. Marker data, labeled or unlabeled, is the reconstructed 3D positions of markers from the 2D images of each camera. These markers do not present rigid body or skeleton solver calculations but locate the actual marker position solely through the Point Cloud reconstruction engine. These markers are represented as a solid sphere in the viewport. By default, labeled markers are colored in white, and unlabeled markers are colored in orange as shown in the chart. Marker colors can be changed from the Application Settings. Rigid body markers or bone markers are expected marker positions. They appear as transparent spheres within a rigid body, or a skeleton, and they reflect the position that the rigid body or skeleton solver expects to find a corresponding reconstructed marker. Calculating these positions assumes that the marker is fixed on a rigid segment that doesn’t deform over the course of capture. When the rigid body solver or skeleton solver are correctly tracking reconstructed markers, both marker reconstructions, and expected marker positions will have similar position values and will closely align in the viewport. Figure 1. Left: Marker data aligned with the expected marker position. Center: slight deviation from the expected position. Right: Marker is now unlabeled due to deviation from the expected position. 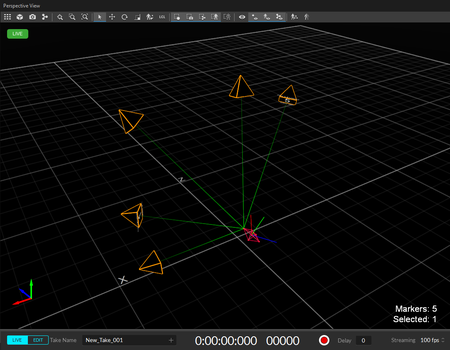 When creating rigid bodies, their associated markers will appear as a network of lines between markers. Skeleton marker expected positions would be located next to body segments, or bones. Please see Figure 2. If the marker placement is distorted during capture, the actual marker position will deviate from the expected position. Eventually, the marker may become unlabeled. Figure 1. shows how actual and expected marker positions could align or deviate from each other. Due to the nature of marker-based mocap systems, labeling errors may occur during capture. Thus, understanding each marker type in Motive is very important for correct interpretation of the data. Read through the Labeling page for more information on marker labels. Figure 2. Left: skeletal bone markers Right: Rigid body markers. This page was last modified on 25 July 2018, at 15:37.